Jalen Ramsey: The NFL’s Premier Shutdown Corner? With the NFL Draft and free agency having come and gone, we’ll break down all sorts of fantasy-relevant questions entering the 2018 season. Up next is a look at a young star cornerback who’s every bit as good in coverage as he is at trash talking. Over the past few seasons, the notion that big, tall cornerbacks can’t keep up with the league’s top receivers has been extinguished by the likes of Richard Sherman and Patrick Peterson. Perhaps this evolution is responsible for the creation of Jalen Ramsey, who doubles as one of the league’s largest yet quickest-twitch corners. Ramsey stands 6-foot-1 and weighs 209 pounds, yet he still ranks top-five in both the vertical jump and broad jump at the NFL Combine over the past 10 years. Taking advantage of a cornerback’s size or speed limitations is usually the easiest way for a quarterback to attack a defense. But in Ramsey’s case, his mix of size and athleticism presents a problem that quarterbacks are better off not even attempting to solve — and that’s before even considering his actual coverage skills. There’s certainly an increasingly valid argument that Ramsey never should have slid to the fifth-overall pick in the 2016 NFL Draft. There’s no such thing as a surefire prospect, but Ramsey’s success as a three-year starter in college combined with his aforementioned measurables and Combine performance made him arguably the most complete cornerback prospect since Peterson. Going into the draft, arguments against Ramsey coming centered around his lack of experience at outside corner along with a perceived lack of ball skills; he had just three interceptions in 41 career games at Florida State. Two seasons into his NFL career, Ramsey has already doubled that interception total and proven he deserves to be in the discussion of the league’s top cornerbacks. As is generally the case on any great defense, Ramsey also benefited from pristine performances from his teammates in the secondary. A.J. Bouye and Aaron Colvin ranked among the league’s top-six full-time cornerbacks in yards allowed per coverage snap (Pro Football Focus) last season, while the Jaguars’ beastly pass rush racked up 55 sacks, second-most in the league. Still, Ramsey is the straw that stirs the drink that is Jaguars’ deadly pass defense; his array of talented teammates just makes the potential for substandard performance that much more unlikely. As Ramsey’s brawl with Green last season (in which they both got ejected) demonstrated, sometimes having to listen to Ramsey’s trash talk for an extended stretch is too much to handle for even the league’s best — and most composed — receivers to handle. Per Adam Levitan, Ramsey ended up allowing 6.88 fewer DraftKings points per game than his opponent’s season average, asserting himself as arguably the NFL’s most dominant shadow corner. Ramsey, who graded out as Pro Football Focus’ No. 3 cornerback in 2017, may also be asked to chase opposing No. 1 receivers into the slot more often in 2018 after the Jaguars allowed Colvin to walk in free agency. 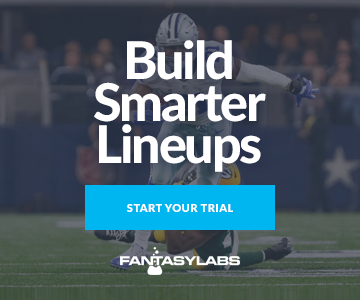 Fantasy investors should be extremely wary of rostering any receivers expected to find themselves in Ramsey’s crosshairs, especially since the best may still be yet to come for the 24-year-old.